The medium-grip lat pull-down is an effective compound exercise for the lats and upper back muscles. Anyone can perform this exercise as it’s very simple, and safe, while a great option for building muscle and gaining strength. But the good thing about the pull-downs is there are so many variations, which creates many possibilities for training the back. Cable exercises are often recommended because they keep tension on the target muscle group, and you don’t have to worry about stabilizing the weight to the same extent as using free weights. The medium-grip lat pull-down is also a great alternative to doing pull-ups since you don’t need much upper body strength to get results. Begin by sitting on the lat pulldown machine and adjust the leg support pads to keep your body in place during the exercise. Now, stand up and grab the bar at a medium-width hand position and sit down so your legs are held down by the support pads. Lean back slightly and pull the bar down to mid-chest area while exhaling. Then slowly allow the bar to go back up the starting position whole inhaling but don’t lock out at the top. Do not perform the pull-down behind the neck as this is potentially dangerous for the shoulders. Keep your back and core tight during the movement. You can use a little momentum to complete the movement when using heavier weight but try to keep it as controlled as possible. 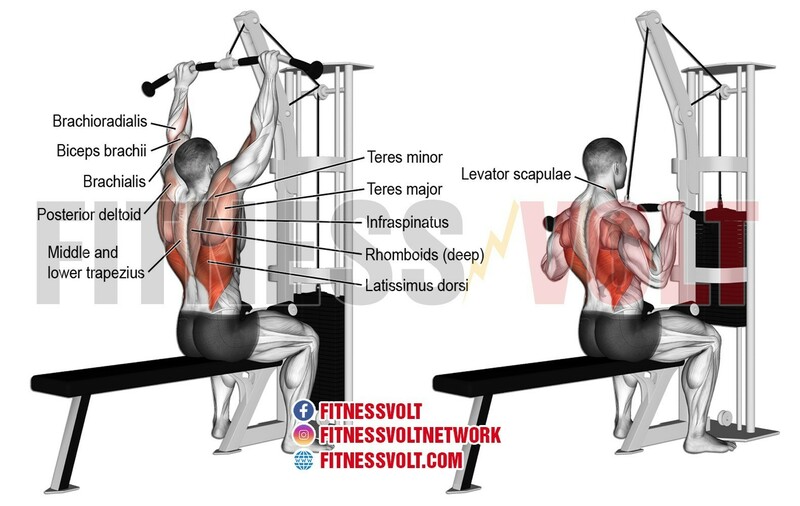 The medium-grip lat pull-down targets the lats but the movement also hits the upper back (Rhomboids) muscles. The biceps and forearms also get stimulated during this exercise since it simulates a pull-up, and requires the arms to pull the weight down.